ic Kathe With an E: Dig, Drop, Get 'Er Done! I have this thing for flower bulbs. I love how easy they are to plant. I love that they come back every year for me to enjoy. Just recently I was introduced to Dig Drop Done. and encourage you as you get ready for planting bulbs and taking care of them. Are you a novice and have no idea where to start? Their "Ready To Learn" menu is the perfect place for you to start. I've also been looking for some new bulbs to plant. and bulbs that bloom later in the season. blooming throughout the Spring, Summer, and Fall. I went through their "Bulb Browser" and BAM! 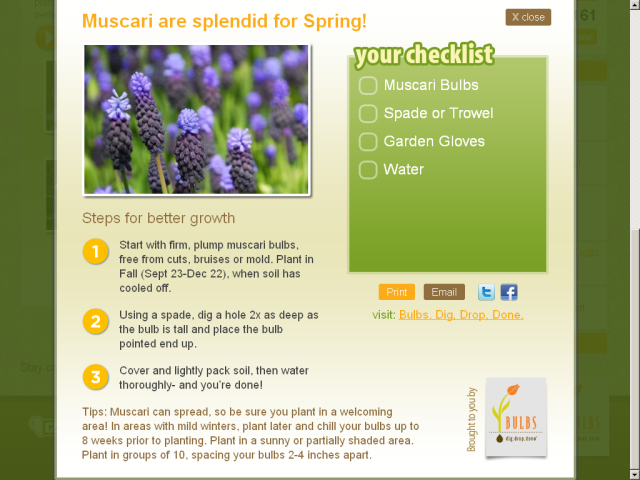 I have always wondered when I could plant Muscari. and selected my area to find out when I can plant them. Now I know! "Ready to Plant" drop down menu. When you click that, it brings up the month we're already in. what you'll need to prepare for next month! For me the ability to plan ahead is huge! and buy what I will need in the future now more economically! most bulbs multiply and can be divided! I can totally relate to Evelyn. I can devote to planting beautiful bulb gardens. is having an awesome contest. They're giving away a $5,000 yard makeover to one lucky winner. When you enter the contest share on Twitter. for every time this contest is shared on Twitter! dig, drop and get 'er done! Get out, that product looks awesome! Thanks for letting us know about it! I love me some fun bright bulbs- they are so easy and look so wonderful! Thanks Kathe! !